For me, some of the best summer days revolve around lying on the sofa and reading, listening to music, (taking a nap), and eating and drinking indulgent concoctions (LOTS of gelato, ice cream and cocktails). I surround myself with vases full of scented flowers from the garden — right now there are sweet peas, roses, tuberose, plate-sized southern magnolias, gardenias, phlox, even tiny bouquets of spicy, bright orange marigolds. And, of course, I wear perfume. For the past three weeks, Seattle has sizzled with temperatures often hovering between 89 and 93 degrees Fahrenheit (31-34 °C); on some days, it's been downright unhealthy to be outside, with smoke from raging fires reaching us from California, eastern Washington/Canada and...SIBERIA. I feel zero guilt for whiling away a morning and/or afternoon "in contemplation." Today I'd like to introduce you to my most recent "Summer Quartet" (the individual parts change, but the pattern remains constant). Composed of aphorisms, fragments and observations both philosophical and personal, Eugene Thacker's Infinite Resignation traces the contours of pessimism, caught as it often is between a philosophical position and a bad attitude. By turns melancholic, misanthropic and tinged with gallows humor, Thacker's writing hovers tenuously between the thought of futility and the futility of thought. I will pay extra to avoid bargaining. On the vanity of existence. People walking slower than me are idiots. People walking faster than me are assholes. And nothing is more annoying than a stranger walking at exactly my pace. When you're alone, your voice sounds different. Vaster. More empty. If enthusiasm is the weakness of pessimists, then procrastination is the weakness of optimists. That 'suffocation of *fashion* egos' was probably why I chose this book for early August instead of what others might consider a more appropriate, and dishy, summer read: Loulou & Yves: The Untold Story of Loulou de La Falaise and the House of Saint Laurent by Christopher Petkanas. I'll get to that one in winter, when depression is part of the landscape and one more sad mud puddle won't send me falling face down. Infinite Resignation also contains an informative section on The Patron Saints of Pessimism: “Kierkegaard: life is a tightrope; Nietzsche: life is a jump rope; Kafka: life is a trip rope; Schopenhauer: life is a noose; Cioran: life is a noose, improperly tied.” This book made me feel better...not worse; I laughed aloud quite often as I read it. What type of pessimist does that make ME? Normal? Fringe? Master? Schopenhauer once said: 'music is the melody to which the world is the text.' A perfect musical accompaniment to Infinite Resignation is Dmitri Shostakovich's 24 Preludes and Fugues for Piano, Op. 87. 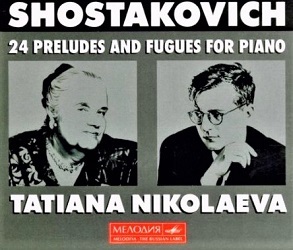 Ages ago, by pure good luck, I bought CDs of this composition performed by the Russian pianist Tatiana Nikolaeva; Shostakovich played the preludes and fugues to Nikolaeva as they were being composed, and he dedicated the work to her. She gave the world premiere performance in 1952 and received Shostakovich's praise for her first recording of the preludes and fugues in 1962; she recorded the complete work three more times — in 1987, 1990 and in 1992 (filmed, and watchable on YouTube). Nikolaeva endeared herself to me not only because of the beauty of her interpretations of these (and other) works, but because she seemed down to earth, hearty and in interviews often talked of scent memories. She said her childhood in the provinces, growing up in Bezhitsa, was infused with the smell and taste of apples and honey. Her father, a pharmacist (and amateur cellist and violinist), would gather music-loving friends (doctors, engineers) on Saturdays in his pharmacy and play the works of Beethoven, Mendelssohn, Tchaikovsky. Though they were not professional musicians and made mistakes, Nikolaeva said those afternoon performances instilled in her a love of music. No matter where she was in the world, she could never hear the quartets of Beethoven without thinking of her father and "smelling" the medicines that filled his pharmacy. 24 Preludes and Fugues for Piano includes works of great diversity: tender, enchanting melodies — happy and sad in character, moments of calm punctuated by strident surprises, simplicity, and mazes of notes that lead to a feeling of freedom or...closure. I often become emotional while listening to Nikolaeva's performances. If you're not familiar with these gorgeous Shostakovich works, watch Nikolaeva talk about her friendship with Shostakovich and listen to her perform selections here. During a concert in San Francisco on Nov. 13, 1993, Nikolaeva was performing the 24 Preludes and Fugues when she suffered a cerebral hemorrhage. She died nine days later on Nov. 22 at age 69. What does a piano smell like? Parfumerie Générale's Querelle2 comes close, if we're talking about a concert grand at least one hundred years old. Querelle has a musty/musky smell (black caraway mixing with a human/cumin-like aroma); its dense lemon, frankincense and myrrh remind me of waxed/polished wood, old felt, "fragrant" dust, and ivory piano keys impregnated with the vitality and scents of those who touched them. Vetiver and oakmoss (as well as the cumin) conjure a pianist, too, in intense performance mode, and these base notes lift the scent, like a delightful chord in the treble range, hit hard, and held till it fades. 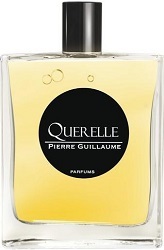 Querelle is one of my favorite summer perfumes; I'm on bottle No. 3. Summer is going by way too FAST, so enjoy the warm days and bounty of the garden while they last. The brief poll: do share your own favorite quartet (book, music, food and perfume) for the season. Parfumerie Générale Querelle Eau de Parfum is €99 for 50 ml (it seems more widely available in Europe than in the U.S.) Infinite Resignation is $17.95. Tatiana Nikolaeva's 24 Preludes & Fugues for Piano, Op. 87 by Dmitri Shostakovich, Melodiya label, is $35 (3 CDs) at Amazon. 1. 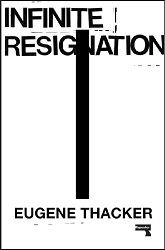 Infinite Resignation by Eugene Thacker, Repeater Books; distributed by Random House in the US; 2018. 2. Perfumer Pierre Guillaume; listed notess of lemon, black caraway seed, cinnamon, frankincense, myrrh, vetiver, oakmoss and ambergris. 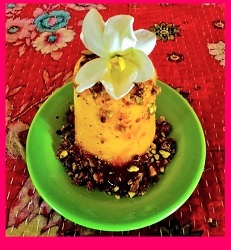 Note: Top and bottom images of mango kulfi by the author. I really enjoyed this post…thanks! Great article Kevin! I just located a bottle of Querelle as I was finishing a decant and realized I needed more, and apparently its discontinued. I was at the concert in San Francisco, Her death was a very sad loss. datura: what a memory you must have of that evening. I did find Querelle for sale on European websites (including First-in-Fragrance); but you’ll be stuck paying a $45 shipping fee. All of a sudden she started missing notes, then she stood up, and sort of wandered off stage, the audience was in shock, you could tell something was very wrong. Osswald Parfumerie in NY still has the PG. datura: I need to get some of her Bach recordings, too. Thanks for the Querelle tip. Scent; Eua de Merveille by Hermes EDT, got a sample in May any used it on a trip to Southern California, now I have a lovely scent memory of the Pacific Ocean with this sparkling amourphos wonder. Book; The Neverending Story, just finished this for the first time, my husband tolled me of reading it as a child and finding the different colored txt so interesting. I really enjoyed it. Music; so many new good things!? If I have to pick just one thing it would be The Pillars of Eternity II game soundtrack, beautifully done and a wonderful accompaniment to reading. Food; Cheerios limited edition Peach ???? flavor. A cold bowl of cereal in the morning( or evening) is really nice when Oklahoma gets hot and muggy, and since truly good peaches aren’t quite at the markets yet, the flavor is really satisfying the craving for late summer fruit. InkyFeathers: now THAT’S a great quartet! Peaches are heavenly up here in the Pacific Northwest; even made jam yesterday…now on to huckleberries and blackberries. Never heard of Cheerios Peach flavor before! I have a great memory of driving through Oklahoma in late spring…the fields were beautiful then. I believe Cheerios has been doing he flavor this summer as a limited release. I do hope they continue it! And yes, Oklahoma is beautiful in the spring, sometimes we also get really pretty falls in the eastern hills where I’m from. Solanace: hey! What sauce are you using on that pasta? Hey, Kevin! I’m in a ragu binge. My Italian granpa’s very traditional recipe: soffrito, beef and pancetta, slowly cooked with white wine, peeled tomatoes and passata. A pinch of nutmeg in the end, after all it’s winter here. Loved the walking pace quote. So true. R: I can get you some chocolate cherry sauce! Graeter’s ice cream is SO GOOD! Scent: I do a lot of summer camp nursing, hiking and water activities in the summer and perfume becomes almost superfluous. On the few occasions when I go “out” I love and enjoy Arielle Shoshana edp. It will be a sad day when my decant runs dry. Music: Khalid’s “American Teen”, definitely my summer anthem. Food: My favorite place to eat in Seattle (Hi Kevin, waving to you!) is at Marination on Alki (if you’re in Seattle when the weather is mild it should not be missed). I’m such a creature of habit, and almost always order the kimchi fried rice. Imagine spicy rice with kimchi, a choice of protein, topped with a fried egg and served with a cold beer. Also…coffee ice cream, any brand, any time! HA! My go-to take out order at Marination on 6th and Virginia is the Korean Cheesesteak (Japanese beef, grilled onions, jalapenos, kimchi, cheese and mayo — no bread) poured over the slaw. YUM! When I finish one of those I feel so guilty. Unfortunately I cannot see you!! I can’t imagine what it must be like for the people who live close to these fires…it’s terrible! I haven’t been to that Marination but am up there frequently enough. I bet that slaw is amazing!! Arielle Shoshanna is coming out in a travel size which I think is 10ml…..in case you run out! I think it will debut on August 18th. Fantastic post! Maybe because I agree with everything said…???? Except kulfi…never tried it, therefore I am suspicious of it. As for pessimism, I think it’s underrated. Nothing can be worse than you anticipate, and when it’s not quite as bad, well, what a lovely surprise! Beautifully illustrated and interesting piece. I’m the opposite of you since I can’t seem to read much of anything besides mysteries, though I do have a Patrick White novel underway now. You know that phrase comes from Kierkegaard’s Either/Or, right? Not my favorite of his books. But important. Calypso: you mean ‘infinite resignation?’ In my notes I had “Fear and Trembling”…but I’ve not read that. Also, how is the Patrick White? Don’t think I’ve read any of his work. Kevin- you are my evil book twin because I read nothing but mysteries! However, this summer I have really done NO reading…not sure why though. Food- anything and everything…I have had a voracious appetite and have enjoyed exploring lots of different cuisines from different ethnicities. Perfume- lavish wearings of older stuff which is new to me…a very generous friend sent me some of her neglected bottles and I have been really wearing the heck out of them…NU, Tendre, Falling in Love, Melograno, Tresor, Mojave Ghost to name a few. Music- nothing…I spend way to much time watching TV…currently binge watching The Indian Detective which is hysterical and also a mystery/crime show. Next up will be Sacred Games. FearsMice: thanks! I use tons of different photo editing apps and cameras. It’s always a fun part of every post to choose the images. BOOK: Pretty much anything, really, although it’s been unbelievably hot here in Southern California and my brain isn’t working right, so lighter fare such as young adult dystopian/fantasy books hit the spot. MUSIC: I find that Angelo Badalamenti’s (most famous for his work on Twin Peaks) music has a chilly vibe that feels just right for summer. FOOD: Ice cream! Sadly I can’t find my favorite flavor (blue moon) outside of the Midwest, but I’m enjoying a new flavor called Unicorn Magic that I found at Target. It’s cherry-flavored ice cream with little shards of glittery white chocolate. Cherry can be a tough flavor to get right because it can skew “cough syrup-y”, but this works! PERFUME: Anything light and inoffensive. Right now I’m cycling between my billion bottles of Harajuku Lovers, though today I decided to go with La Vie de Boheme by Anna Sui instead. Caffeinequeen: had to look up Blue Moon…’the flavor of Fruit Loops and Fruity Pebbles’…could be good! Have you read Station Eleven? It’s one of my all time favorite dystopian novels! Nightingale: nope…just added it to The List. Thanks. Blue Moon is my favorite flavor too!! Our house is hot as hell, facing open pastureland to the south, the smoke and haze are so bad we’re closing all the doors and windows, and my apples are ripe a month early, so I’m dreading standing over a hot stove and canning in a few days. HOWEVER, as we say in the PacNW, it’s fine! Books: reading the latest Joni Mitchell bio, it’s terrific. Music: Matt Fishel, new queer rock n’ roller from the UK, VERY clever, witty, and snarky. Also as of yesterday the new Jake Shears album. Food: too hot to cook except grill, but mostly salads from the garden, and tonight fresh crab a friend just caught this morning. Perfume: Chanel 5 Elixir Sensuel which is lighter with a brighter floralcy, and lots of various Perris Monte Carlo as they never disappoint. Spouse is down at the tragic Seattle gift show a.k.a the 3rd ring of hell, and thankfully I decided to stay home this time. Hope the heat/smoke breaks and you have a wonderful rest of summer! Fragrantwanderer! I’m so glad you mentioned the gift show since I have to go downtown on Friday and will AVOID that area. We are living the same life: made peach jam yesterday, apricot before that, and today made chili relish. Blueberry and huckleberry jam to do next. This steamy heat reminds me of the South. Will get that book. I think Joni Mitchell should have won the first Nobel Prize in songwriting! I’ve spent the last few months listening to all her albums for the first time…sensational. Hejira! jbordeau: great quartet! I’m ashamed to admit I’ve never read ‘Faggots’ (but added that to the list today as well)…but I did just read ‘Has the Gay Movement Failed?” by Martin Duberman and it was great. Also, I googled Ca Sent Beau and was sad I couldn’t smell it…I usually love Francoise Caron’s perfumes. This post was just a delight to read! 4. Perfume – Mohur. It’s rosiness reminds me of Spring but it is still warm, enveloping and a little bit spicy. Emilie: wow…winter sounds SO good now! (Though today we have a cool morning in Seattle…relief). Your soup sounds delicious. Hehe, Winter is not my favourite season so I have to fill it up with nice things to make it so Enjoy the cool spell! Lovely post. And I enjoyed reading about all the other’s quartets! Amyitis: thanks…and people really have great quartets. First, your comment on people answering that they are great or doing fine in Seattle got me thinking about the differences in culture. Here in Catalunya, Spain, its the opposite, people always answer “nem fent” which means I am making it or Im getting by. Different approaches, right? One of the best books Ive read is “In the distance” by Hernan Diaz, please read it if you have a chance. Perfume: Ormonde Jayne samples, love her. Food: Take a look at the site Minimalistbaker, her recipes are vegan and so easy to make. Im not vegan but her granola and cookies recipes are delicious. Music: A Brazilian singer, Marisa Monte, best voice ever. Also, for reminding me that summer is going by too fast… I need to cherish every day with my girls on the beach. Gabriela: you’ll never believe this, but as I was reading your comment Gal Costa was singing “Modinha para Gabriela” in the background! HA! Thanks for all the recommendations! AND you must have laughed at our “heat” in Seattle compared to Spain. Ohh what a beautiful coincidence. Gal is a great singer too. And the author of Gabriela, Jorge Amando, is a fantastic Brazilian writer. The heat here is much better now! All while floating on a massive pool lounger in a huge hat with 100 spf applied lavishly so that I might stay there all day. ???? Laura: I know you have LOTS more heat coming in Texas…till October? A frozen margarita sounds GOOOOOD. Gosh, I’ve loved reading this and everyone’s responses. And I want to check out that book now. 1) Books: This summer has been all about death: Caitlin Doughty’s 2 books back to back: When Smoke Gets in Your Eyes (and other lessons from the crematory), and From Here to Eternity: Traveling the World to Find the Good Death. They are surprisingly heartwarming and fascinating. 2) Music: Mostly whatever I’m learning to play on the uke, over and over again. Right now it’s Django Reinhardt Minor Swing. It’s hard!! 4) My most worn this summer are BF Monserrat and CdG Lily. Elisa: I enjoyed those two books as well. I do think you’ll appreciate ‘Infinite Resignation’…I want to read his other books now.